Hitoshi Sakimoto, without any doubt, belongs to the Eastern game music’s hall of fame. His credits include well-known titles like Final Fantasy XII, Final Fantasy Tactics, Valkyria Chronicles, as well as cult hits like Breath of Fire V: Dragon Quarter, Vagrant Story and Mahou Daisakusen: Kingdom Grandprix. Today, he runs his own company Basiscape, as well as the music label Basiscape Records. His unique style and versatile musicianship also make him one of the most recognisable artists in the industry. 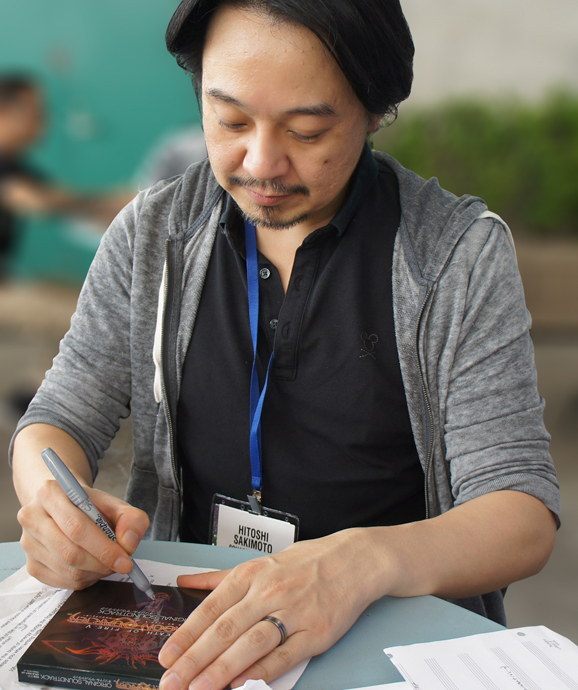 In this interview conducted during E3 2015, Sakimoto chatted with VGMO about his past, present and future works, his influences, his current favorite game music and more. He also answered a few questions asked by the Breath of Fire fan community about his work on Breath of Fire V: Dragon Quarter. Patrick: Sakimoto-san, thank you for taking the time to do this. I want to start off: how are you doing? Hitoshi Sakimoto: I’m enjoying E3. Patrick: Last night was the Distant Worlds: Final Fantasy concert, and you were there as a guest. How did you enjoy the show last night? Hitoshi Sakimoto: Out of all of the many concerts I’ve been to, the American audience is the most excited. I appreciate that. Patrick: It tends to be that in Japanese videogame music concerts, everyone is quiet until the end, and that’s when they start clapping. I’ve noticed there is this big difference between the two crowds. You prefer the American crowd, then? 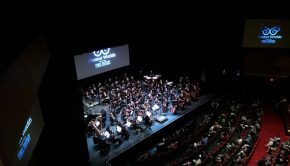 Patrick: Distant Worlds performed “The Dalmasca Estersand” and “Boss Battle” from Final Fantasy XII last night. What did you think of the arrangements? Hitoshi Sakimoto: I think the arrangements and the orchestration were really, really good. The performers in particular were great. Patrick: With the “Boss Battle” music from Final Fantasy XII, I really like how it starts off very slow, with lots of build-up, and by the end it becomes really energetic. It kind of comes out of nowhere. I was curious, what helps you when you write battle music? Hitoshi Sakimoto: I just love that kind of music. I want the player to feel that excitement as well. Patrick: What are some of your musical influences growing up? Patrick: That inspired a lot of composers! Hitoshi Sakimoto: Yeah. She also bought rock music from overseas. Patrick: Any particular bands? American or…? Hitoshi Sakimoto: My main influences are YMO and Kraftwerk, but I also really love progressive rock bands such as Emerson Lake & Palmer and early Genesis (before Phil Collins). Patrick: Back in the 90s, in the Sega Megadrive/Genesis era, you created a sound driver, the “Terpsichorean,” which enhanced the music, made it better. I know you used that for games like Gauntlet IV. How did you make a program like this, and why did you make it? Hitoshi Sakimoto: I had bought a personal computer at that time… nowadays, we have applications or middleware to use when composing. At that time, every user had to build the application first. The OS was installed, but there was almost nothing. I started to build applications when I got my PC. I talked to my friend, a programmer that was making an application for a game, and he had some knowledge about music, so I started composing for that. Patrick: It’s interesting about that sound program for the Megadrive, you can make more orchestra sounds with it, whereas with usual Megadrive music, it’s more rock-oriented. When you made Gauntlet IV’s music, it sounded a lot more orchestral than most Megadrive games. Patrick: Yeah, it sounds more orchestral to me! By making that program, you improved the sound of the system. You’ve also composed a lot of soundtracks with Masaharu Iwata, Mahou Daisakusen: Kingdom Grandprix, Final Fantasy Tactics, Gauntlet IV to name a few. How did you come to compose so many soundtracks together? Were you partners? Hitoshi Sakimoto: Regarding Mahou Daisakusen: Kingdom Grandprix, do you know why I gave these [names] to the tracks? I was lazy and decided to use horseback riding words. I was learning how to horseback ride ten years ago. Hitoshi Sakimoto: When I was a high school student, I was making a game with a friend. At that time I first met Iwata-san. Later, Iwata-san was working at a game company [called Bothtec] and gave me the opportunity to compose. Since then, I’ve had a long-time partnership with him. Patrick: Would you say that Iwata-san brought you into videogame music? Hitoshi Sakimoto: At the time I had another job, a writer for game magazines. I was working on sound design for a game. Hitoshi Sakimoto: A games/tech writer, yeah, for Oh!FM magazine. It was a magazine related to Fujitsu. I was writing general things about the personal computer. Since then, I have worked with Iwata-san similarly to how a typical Hollywood composer would have an assistant, but he is more like a partner. We’re old friends. Patrick: I was curious to know how you came to compose for Breath of Fire V: Dragon Quarter. Did Capcom ask you to compose for it? Hitoshi Sakimoto: Yeah. I don’t know the reason, though. Maybe the producer or the director liked my music. Patrick: How was Yasunori Mitsuda involved with the project? 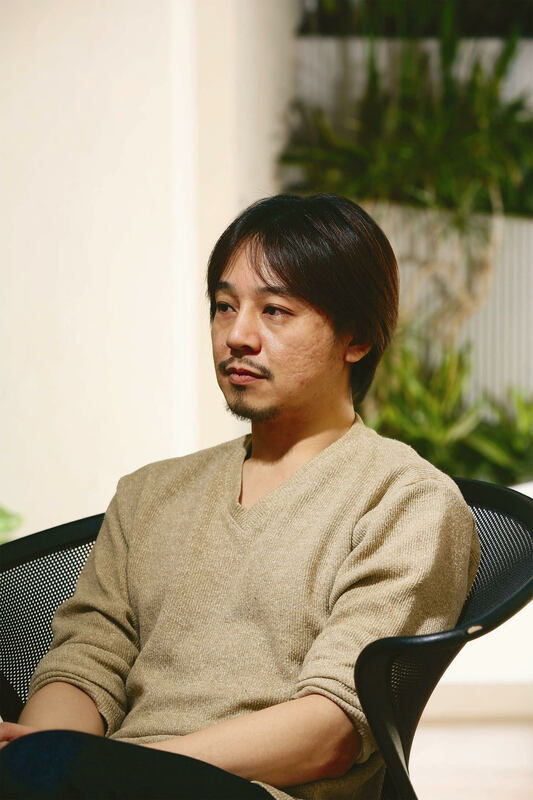 Hitoshi Sakimoto: I knew Mitsuda-san personally before Capcom asked me to compose. Capcom wanted Mitsuda-san to introduce me to them, because they knew of my style. I’m not sure if Mitsuda-san was really involved in anything else with the game. Patrick: What inspired you when making Dragon Quarter’s music? It’s very orchestral, but because it’s a futuristic, sci-fi game, it’s also very electronic. What kind of inspiration or influences did you have when mixing the two genres together? 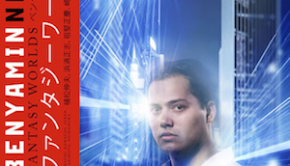 Hitoshi Sakimoto: I wanted to create a fusion of orchestra and techno, as much as I could. I wanted to see what would happen. I thought it could be very unique and very special version of my musical style. Patrick: Is it challenging? Electronica and orchestral are very different genres. Was it easy for you to put the two together? Hitoshi Sakimoto: I was happy to take that kind of challenge. Both of those styles were my favorite types of music, so why not mix it up and create awesome, new music? Patrick: What is your favorite track that you composed from the Breath of Fire V: Dragon Quarter OST? Hitoshi Sakimoto: I was most impressed by the ending movie sequence, so I can say that my favorite track was the ending theme. Patrick: What was going through your mind when thinking about how to arrange the tracks for Breath of Fire V? What did you think about the story and themes? 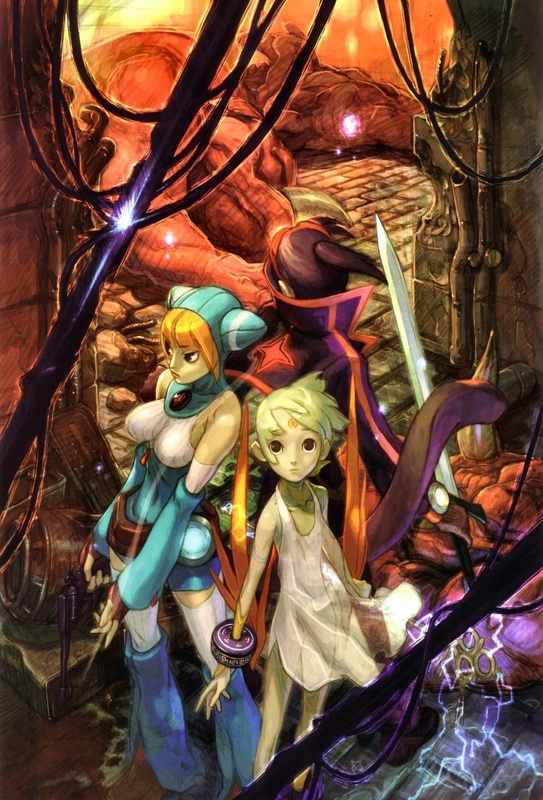 Hitoshi Sakimoto: I was excited to work on Breath of Fire V because it was a sci-fi game with an amazing scenario. While it featured an emotional story, there were strong messages of hope for the future and of heartfelt trust. That’s what I tried to express with the music for the game, and I hope that came through! Patrick: Did you draw any inspiration from composers from the previous games in the series? Hitoshi Sakimoto: Of course, I was already a fan of the past Breath of Fire soundtracks, so I had to make the difficult decision of following my predecessors or developing my own sound. I actually tried both approaches, but felt I couldn’t replicate the styles of my predecessors, so instead did the best I could with my own voice. Patrick: What’s a personal favorite work of yours that you’ve done? Hitoshi Sakimoto: Usually I like my latest work. Right now, it’s the music I did for a Japanese animation, Chaos Dragon. Patrick: Do you have a particular favorite videogame soundtrack you didn’t personally compose? Hitoshi Sakimoto: I have lots of favorites, I wouldn’t be able to stop saying all of them. [laughter] For a recent one, there’s The Witcher III: Wild Hunt. It’s very good. Patrick: Are you playing that right now? Patrick: You should play it, it’s really good! I’m playing it, too. Hitoshi Sakimoto: I really want to play it, but I just watched the highlights of the game [online]. Dragon Age: Inquisition, that was good too. Patrick: Recently, you composed for an indie game, Little Noah. 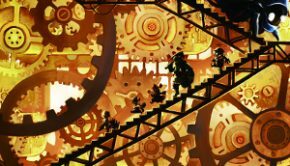 What’s the difference between making music for a small indie game and bigger projects? Is there anything different in your approach? Hitoshi Sakimoto: My compositional style for Little Noah was not very different from bigger titles. One thing I tried was to put more effort to make it sound better for a mobile phone, to make it clearer. Patrick: It can be difficult when people are playing mobile games, on a train for instance, sometimes they might not have headphones. So you need to kind of “make” them wear the headphones so that they can listen. Patrick: What can we look forward to in the future? Any specific projects that you can talk about? 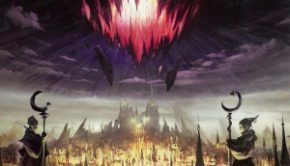 Hitoshi Sakimoto: I can’t announce what hasn’t been announced yet, but I can tell you there will be new Terra Battle music that will be recorded as part of the game’s “Download Starter 2” campaign. Patrick: Finally, what would you like to say to fans of your music? Hitoshi Sakimoto: I entered this business because I love games. I did whatever I could for the 20 to 30 years I’ve been working on them. I’m very grateful for the fans overseas that know my name. I would like to continue that kind of work, because I really love these kinds of jobs. I used to only work in Japan, but it’s become different. I have more opportunities to work overseas, such as in the U.S. I’m looking forward to those kind of opportunities. Patrick: That’s very exciting, I look forward to more from you. Thank you very much for the interview. Posted on July 26, 2015 by Patrick Kulikowski. Last modified on July 26, 2015. Really great interview, Patrick. Loved reading his thoughts on the Megadrive tunes. He really seems like he truly enjoys his work, and that’s always a pleasure to see.